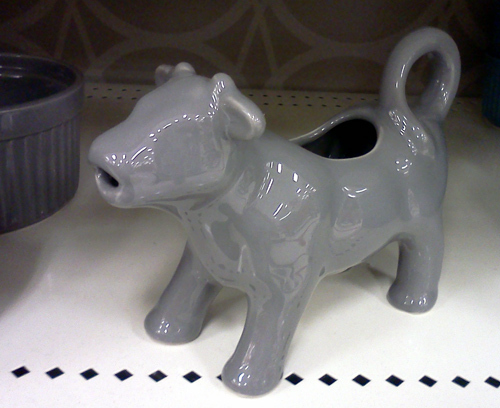 Target has new cow creamers! I went to Target yesterday and was pleasantly surprised to see they have a new dishware collection, featuring several colors depending on your mood of the day and your individual taste. I saw red dishes, but also grey and yellow. I don’t know about you but I wouldn’t want to eat anything out of a dark grey plate. Unfortunately my Target store all out of the red cow creamers (I would have loved to see that), but here’s the grey one. Not so appetizing, right? And here’s the yellow one, a lot more joyful. Doesn’t it look like it’s made out of butter and ready to melt? It’s even smiling. 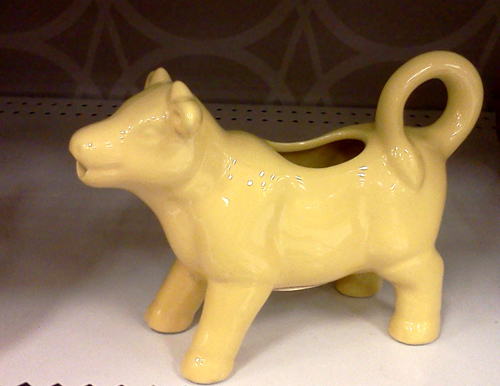 If you own a cow creamer, I’d love to hear what color or pattern it is. I’d love to have a cow creamer but I’d break myself so I don’t. Amazon has a yellow cow creamer similar to the one from Target (http://www.amazon.com/gp/product/B002ZUFYDG/ref=as_li_ss_tl?ie=UTF8&tag=marketing020-20&linkCode=as2&camp=1789&creative=390957&creativeASIN=B002ZUFYDG). If you don’t like that one, they still have tons of really cute cow creamers for sale (http://www.amazon.com/mn/search/?_encoding=UTF8&tag=marketing020-20&linkCode=ur2&camp=1789&creative=390957&field-keywords=cow%20creamer&url=search-alias%3Dgarden). Good luck! I have a red cow creamer! I am not sure the age of it but it is in great condition! I’m interested in selling it for about 20 bucks.